It is very easy (and low cost) to get on the air on 5.6GHz (the 6 cm amateur band), using the cheap modules intended to transmit “First Person Video” (FPV) back from drones to their operators. 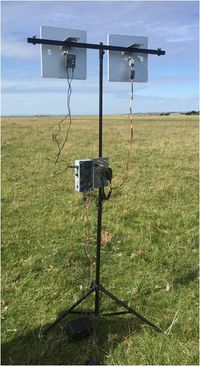 These units can be used without any modifications to get on air, and with simple WiFi plate or dish antennas (and a clear line of sight path) can be used to send pictures to stations using the same equipment over paths in excess of 50km. 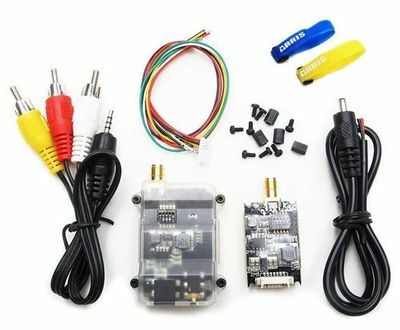 The FPV equipment receive and transmit frequencies are set using DIP switches, and most tune to 5665 MHz – but care needs to be taken when selecting equipment to make sure it does cover this frequency. Example channel tables are shown at the bottom of this page. The FPV units are widely advertised on eBay and other sites with titles similar to “Tarot 5.8G 600MW Telemetry TX/RX Combo for FPV Image Transmission TL300N” and are available at reasonable prices. The typical units are very small but have reasonable FM-TV performance with a quoted transmitter spec of 600mW output and receiver sensitivity of -80dBm. Amplifiers are available to raise the output power to 2 watts or more. Be aware – we have found that on some receiver units, the video output is on the Red phono lead and not the expected Yellow lead! 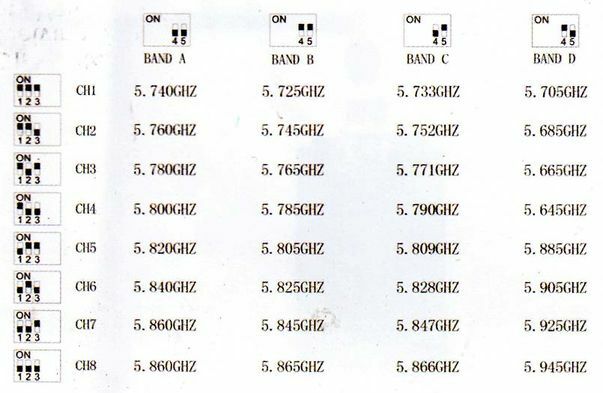 Some other users' stations are described here 5.6 GHz Equipment Examples. Due to the very high losses in co-ax cable at 5.6GHz it is recommended that you mount the units very close to the antennas and run long 12V dc, audio and video cables back down to the shack or operating position. Be aware also, that whilst these units are very small they do run very hot in operation, and it is suggested that you provide a good heatsink for both Tx and Rx – mounting them in a diecast box on the back of their respective antennas is ideal. 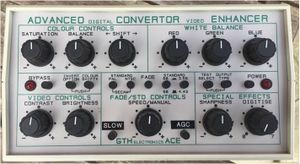 Whilst the basic units work very well and have been used to transmit over paths of 60km, power amplifiers to boost the 600mW transmitter signal to 2—4 Watts are available from several suppliers on eBay and other sites, and will significantly increase the path length that the units will work over. These amplifiers should be connected after the transmit unit, but before any antenna change over relay(s) – and remember that his will increase the volt drop on any long 12V cable feeding the transmitter at the masthead. Be warned!! 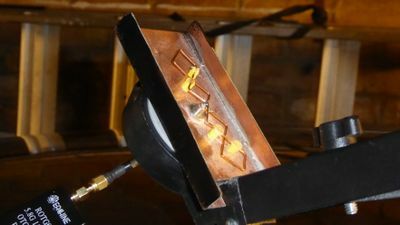 Several users have found these PAs to be "fragile", so you should always make sure that the antenna is connected – and all connectors done up tight – before applying dc or RF power. We are investigating whether they can be made more reliable by reducing the volts / input drive. The FPV equipment comes as separate Tx and Rx units. In order to operate on a single antenna, you will need an antenna changeover relay. 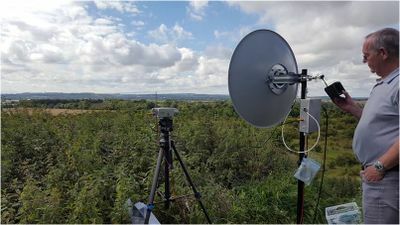 Note, however, that the losses at 5.6GHz can be significant and care must be taken when wiring up the units to ensure RF cables are of good quality, and kept to a minimum length – semi-rigid cables fitted with SMA connectors are ideal. PL259 and even BNC connectors are very lossy at 5.6GHz and should not be used, but the surplus SMA relays often available at rallys are ideal for 5.6 GHz. See this wiki page for more details on suitable relays, 24 volt operation, and 4 port (or transfer) relays. If no suitable relay is available, it may be cheaper to use separate antennas for receive and transmit as shown in the picture below – note the Tx and Rx units are mounted directly on the back of the flat panel antennas. Be aware that all the 5.6GHz FPV units use "reverse SMA" connectors (as used on WiFi equipment) and that all low-loss cables (unless bought specifically for the purpose) and surplus SMA relays will almost certainly have standard SMA connectors – which will not fit. Adapters from reverse to standard SMA are available on eBay or other suppliers – search for "RP-SMA to SMA adaptor" or similar wording. As 5.8GHz is used by broadband wireless networks, there is a wide choice of antennas available for use on 5.6GHz ATV. These can range from flat plates/panels to wire mesh (grid) dishes, as seen in the above pictures. Dishes of this size typically have a beam width of 4—8 degrees. 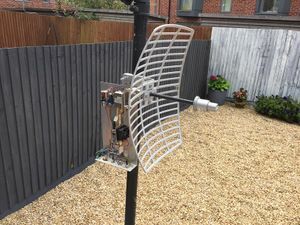 This web page http://buildyourownantenna.blogspot.co.uk/2014/07/double-biquad-sector-antenna-for-5-ghz-wifi.html has a well engineered double BiQuad antenna with a quoted 13dBi gain. Note in the picture G8JAN has directly connected the Tx module to the antenna to avoid co-ax losses. The receiver output will need to be directly connected to a monitor with a composite video input to view the received the signal – normally on a yellow phono or RCA connector. Beware of using modern flat-screen monitors which have a video squelch – these will not display noisy signals, and just give a blue screen until they get a strong video signal. There are a number of circuits around to defeat the squelch and also improve the readability of the signal. 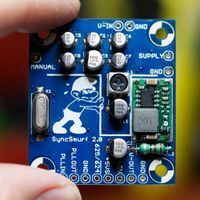 ===Syncsmurf by PE1RQM=== – kits are available; details on the webpage here. 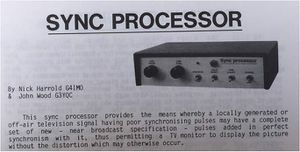 Or any video sync processor may be usable such as the Advanced Converter Enhancer used by many stations on 23cms FM TV transmissions. An old camcorder with a yellow phono "video out" socket is an ideal video and audio source for the transmitter. Don't forget that you will need to display your call sign to remain legal. This can be a video generator, a .jpg card reader with video out, or a piece of card with your call sign scribbled on it! A simple way to generate test patterns is to use a media card reader loaded with .jpg files – these are available on several sites, just search for "SD card media AV player" – but make sure you get one which outputs PAL video. The PicDream project uses a single PIC chip and a 4MHz crystal to generate a black and white test pattern – simple but effective – the original project was described in CQ-TV 180 and re-printed in CQ-TV 247. The PicDream II project uses a PIC chip and an AD724 PAL ecnoder chip to generate a colour test pattern with moving insets. The text and colours on the test pattern can be set through it's serial link. 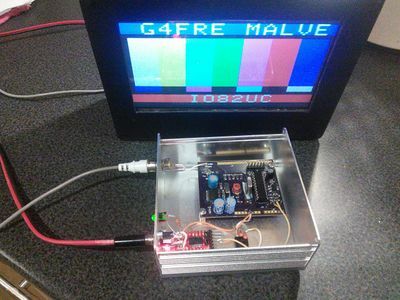 CQ-TV 247 published details of a simple RPi-based test card generator by Ernest PA3CHM. The BATC Portsdown project can be configured to deliver composite video and audio out from the RPi multi-jack plug. This can be test patterns, RPi desktop, or the Portsdown camera and microphone – see this wiki page for more details making the RPi the only piece of video/audio equipment you need to drive the 5.6GHz transmitter. Using dish aerials of 30—60cm, line of sight ranges of 80km can easily be achieved. 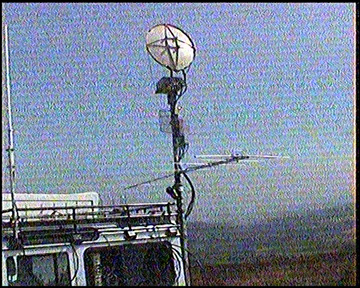 P5 (noise free) FM ATV pictures have been exchanged over a 138km path using the equipment described on this page – the picture below shows G4CPE/P on Dunstable Downs being received at the Ridgeway, near Didcot, over a slightly obstructed 66km path. Dunkery Beacon near Minehead, to Cleeve Common near Cheltenham. The picture shows G8GTZ/P received by G8GKQ/P over the 138km path. 2018-04-21: The UK "record" for a contact using standard FPV units was increased to 153km between GW3NWR/P at Bylchau, North Wales to M0KPW/P and G0HIK/P at the Kirkstone Pass Inn, Cumbria. This has since been surpassed. Several stations in the Gloucester and Bolton area are using these units for wideband FM voice only. This is achieved by simply putting high level (1V peak-peak) audio on the yellow video TX phono input – this modulates the main high level carrier with audio rather than video (the two audio phono connectors – red and white – can be ignored). On RX, the yellow phono connector of the receiver is simply connected to a line level input of an audio amplifier. It is done this way because the two audio subcarriers transmitted by the unit are at a level 20dB lower than that of the main (video)carrier. However, as it is using the same bandwidth Rx and Tx system, performance will be no better than FM video – ideally the 480MHz RX IF would be tapped off in to an SDR or narrow band receiver to give significantly enhanced (+20db?) narrow band performance. Dave G8GKQ did a presentation at the BATC annual convention CAT17 in September 2017 on getting started on 5.6GHz ATV. Note that the BATC core team do not regularly visit Facebook pages - time is just too short to monitor everything and it's not easy to follow threads on Facebook. The large RX chip in most units has had the part number removed, however it appears that a lot of receivers use the SM201R module. The spec and pinout are shown below but notice the frequency range of this particular unit does not seem to cover 5665MHz, so make sure the one you buy does! 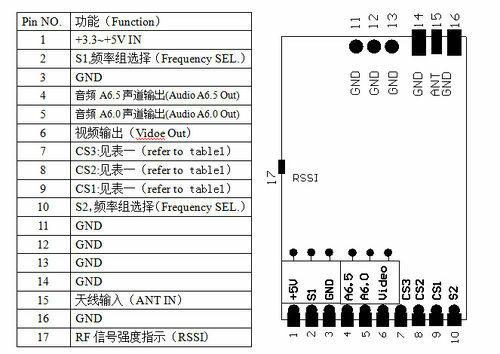 Looking at the above table, it appears that the RSSI is available on pin 17 of the SM201R and could potentially be used for a signal strength meter to help align the antennas when setting up a QSO. 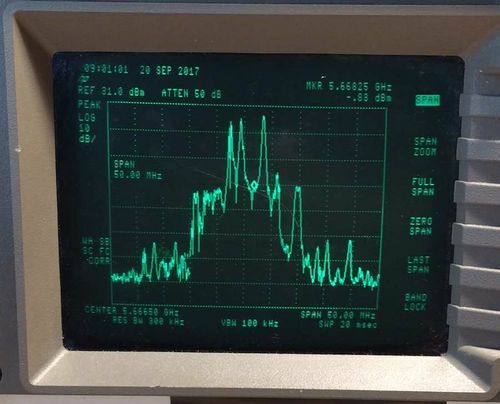 It also appears that the SM201R uses a 480MHz IF (same as the Comtech) and potentially could be modified with narrower filters to improve RF performance. Initial measurements suggest the TX bandwidth is 25—30MHz. This accounts for the quoted RX sensitivity at -80dBm which may be improved by an LNA but will ultimately be limited by the RX IF bandwidth. In CQ-TV 260, Achille I2GLI described improvements and additions to the Mateksys VTX-HV drone transmitter to make a high quality 18 watt output 5.6 GHz FM transmitter. One of the improvements was to replace the video and sound baseband circuitry. 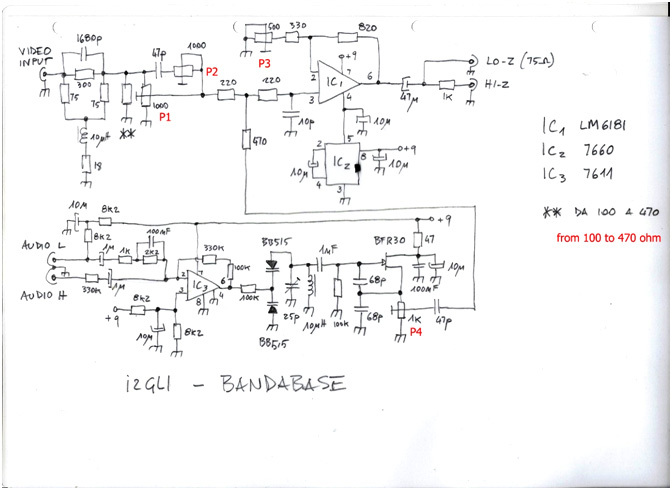 The published circuit diagram in online CQ-TV was a little unclear (although the printed version is good). The circuit diagram is reproduced below.